Every so often, even a blasé Edinburgh audience is moved to utter that much-overused word ‘unique’. It happened with what became known as ‘the cherry blossom Macbeth‘, it happened with the premiere of Mary Queen of Scots got her Head Chopped Off, and it happened on the second day of the Haggis Hunting conference. The Traverse Theatre presented an acted reading of a recreation of the 1522 (?) version of Ane Satyre of the Thrie Estaitis. This version is due to be performed, later this summer, in its original location in Linlithgow Palace and, despite the archaic Scots, the cosmopolitan audience appeared to have little difficulty with the text. As one of the cast said, during the Q&A which followed, ‘It’s no different really from doing Shakespeare, but in Scots’. 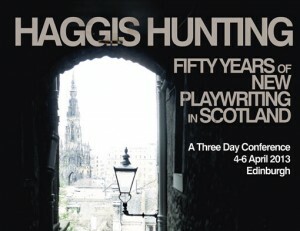 The conference title comes from a speech in the 1970s in which Professor Jan MacDonald said that the search for the great Scottish play should not be like a haggis hunt. The conference, which took place in Edinburgh in April 2013, was created and co-curated by Nicola McCartney and K.M. Morgan McKean. It was a joint project with the Universities of Edinburgh and Greenwich, the Traverse Theatre and Scottish Society of Playwrights, who are celebrating their respective 50th and 40th anniversaries. As might be expected from a conference featuring international academics, theatre practitioners and cultural commentators, it was full of highlights and gave rise to some rather memorable quotations. One such came from Dr Trish Reid in her opening keynote speech, using the lyrics of Hamish Henderson’s stirring and subversive ‘Freedom Come All Ye’. In the Q&A which followed she referred to ‘justified outrage and defiant optimism’ that the series ‘12 Key Plays’ featured only three by women writers. Daniele Berton-Charriere, who had the unenviable task of speaking first in the first series of discussions, under the general title of Staging Identities, rose magnificently to the challenge of a paper entitled ‘Hunting for the Haggis Through Roots and Shoots’ by showing pictures of an Edwardian hunting party, entitled ‘The Last Great Haggis Hunt’, hosted by Sir Ralf Liopo. Enthusiastic crossword puzzlers muttered over the anagram then giggled sedately. Dr Reid described Scottish writers as ‘overcoming the problems inherent in identity’. In the same section of the programme, Penelope Walrath Cole from the University of Colorado presented a paper on Ena Lamont Stewart, stressing that the 1947 version of Men Should Weep was very different from that presented in either 1974 or 1982. Dr Reid was of the opinion that Stewart presented ‘a proselytised nostalgia for an industrial past’ and cited her own grandmother as saying, ‘sometimes you have to do certain things just to get a washing machine’. This sentiment was widely enjoyed by the women in the audience. The topic Global Scotland was very much the theme of the conference. For example, the internationality of the theatrical form was underlined by Andras Beck, who reminded the audience in his morning presentation that Scotland and Hungary had an historic connection stretching over an entire millennium; Pamela McQueen found in the works of David Greig a way of ‘opening up new ways of being Scottish’; and during Saturday’s Past and Present section a delegate revealed that he took great personal delight in the fact that Anton Chekhov’s first work was premiered in Glasgow rather than any other city in the UK, simply because the Scots clearly understood Chekhov; and later, discussing John McGrath and 7:84, Professor Ian Brown and Sim Innes were supportive of the idea that, since 1973 at least, Scotland has been able to identify itself as outward-looking and pro-European. A topical highlight was the debate Scottish Theatre and the Referendum, 1979 and 2014, for which the playwright David Greig chaired a panel of ten speakers and won hearts all throughout the Traverse when he described the audience as ‘at least as distinguished as the speakers’. the question on the ballot paper for 2014 should be rephrased – given the things that will NOT change, it should read ‘do you want more of the same, with a different name?’. Peter Arnott commented, ‘Scotland is not leaving the United Kingdom, we are being left’, while Scotsman theatre critic Joyce McMillan observed that ‘ The three referenda have been and will be very different: 1979, was the “cheek to be cheerful” vote; 1997, “the settled will of the people” phase; and 2014, “a very damaging polarising question”. Trish Reid said that ‘for a theatre maker, Scottish theatre emphasises that the expression “the more local, the more global” is perfectly true’, noting that Gregory Burke’s first play, Gagarin Way, opened a mere three weeks before the attacks on the Twin Towers in New York City. Orla O’Loughlin, Artistic Director of the Traverse commented that ‘Irony is disappearing – there are no sofas, carpets, and certainly no kitchen sinks in the new work that’s coming in.’ In summing up this panel discussion, David Greig made the point that not enough thought had ever been given to how an audience shapes theatre. In his closing keynote speech, ‘Hunting Kudu in Streatham’(full text in issue 137 of Edinburgh Review), he made the remarkable statement that Scottish playwrights, and indeed audiences and voters, should ‘embrace the gift of peripherality’.